Harbor East is a boater’s paradise! 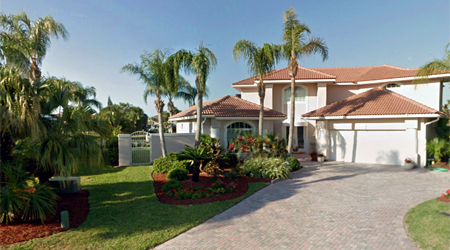 This desirable family neighborhood features executive homes lining deepwater canals that lead directly to the Indian River Lagoon. 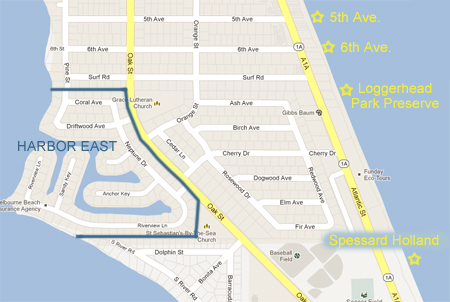 Harbor East is one of only four canalfront communities in the area, and the only one within the town limits of Melbourne Beach. 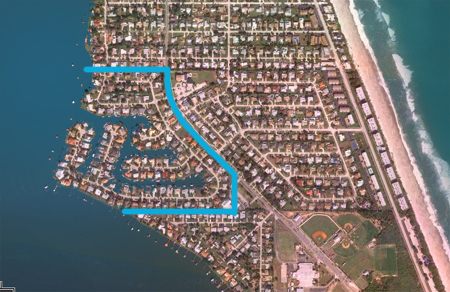 Harbor East is located within the southern boundary of the Melbourne Beach town limits near Flutie Park and Gemini Elementary. Accessed from Oak Street through two landscaped community entrances. Info: Cul de sacs, two landscaped entries, beautifully maintained, great location near schools, town, etc. Beaches: Harbor East is on the river side of the island, and does not have a dedicated beach access. Convenient public access points are nearby, indicated by yellow stars in the map above. Parking (where available) and beach access are free of charge at all locations (no parking is permitted at the Loggerhead Park Preserve). Spessard Holland is an excellent Brevard County beach park with ample parking, showers, bath and changing rooms and picnic areas. Home styles – Deed restrictions allow for varied architectural styles. Community Size – Approx. 150 homes, mostly waterfront.